The Location - situated 3 blocks to the waterfront and walking distance to the Business District and 2 blocks to the Shangri-la Hotel/condo which has an Urban Fare supermarket. The Qube offers affordable living in Coal Harbour. 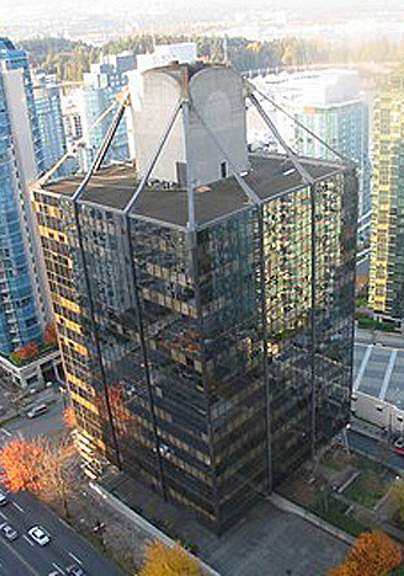 The Building - The Qube at 1333 W Georgia Street, Vancouver, BC, V6E 4V3 . Originally built in the '60s as the Westcoast Transmission office building. The company was bought out by Duke Energy and then purchased by a Developer who converted it to a condo. It opened in 2006. The building was built as an earthquake proof structure and is a Vancouver landmark. It is a 15 level building with 181 suites. Features Overheight ceilings in every suite help expand your sense of personal space. Conceived to satisfy your need for efficience, beauty and charm. Open living areas, sleek European inspired kitchens and exceptional detailing throughout are conceived to enrich your living experience. Outside the Qube boasts lush, mature landscaping The interiors are high end with hardwood floors. The Amenities - because it was an office building, the Qube has the luxury of 4 elevators. The building has a gym and bike room and it now has a concierge. The Floorplans there are 14 suites per floor. The 02, 06, 09,14 are 936 sq.ft. 2 bedrooms and are all corner suites. The 07 and 08 are 670 sq.ft. l bedrooms facing east. The 10, 11, 12 and 13 are studios 420 sq.ft. facing south. The 03, 04 and 05 are 560 sq.ft. l bedrooms facing north with great water and mountain views. The 01 and 15 suites are 770 sq.f.t l bedrooms facing west.